Since the origins of to-go pizza, pizzerias and pizza chains have taken great pride in covering take-out boxes with captivating designs. They’ve also wrestled with the best way to manufacture a box that can keep a pizza both hot and stable. Here the world’s expert on pizza boxes collects 100 weird and wild box designs and explores the curious history of the pizza box. Included are international designs, corporate designs, and dozens of quirky images produced by and for mom-and-pop pizzerias. Where does all of this art come from? Scott Wiener has been collecting and cataloging pizza boxes for 10 years. 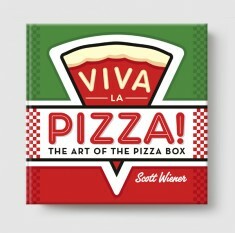 In Viva La Pizza!—named after a popular box design—Wiener traces design trends over the past four decades and speaks to some of the world’s most prolific box designers. The result is a captivating look at pizza culture and a new way to look at one of the world’s favorite foods. SCOTT WIENER’s writing appears online at Serious Eats and on his blog, Scott’s Pizza Journal. His award-winning column, “Man on the Street,” appears monthly in Pizza Today Magazine. He is the founder of Scott’s Pizza Tours, which guides tourists and New Yorkers though the history, science, and culture of New York City pizza. The tours have been featured on the Food Network, the Cooking Channel, the Travel Channel, the Discovery Channel, Lonely Planet, and a host of other outlets. Wiener maintains the world’s largest archive of unique pizza boxes.